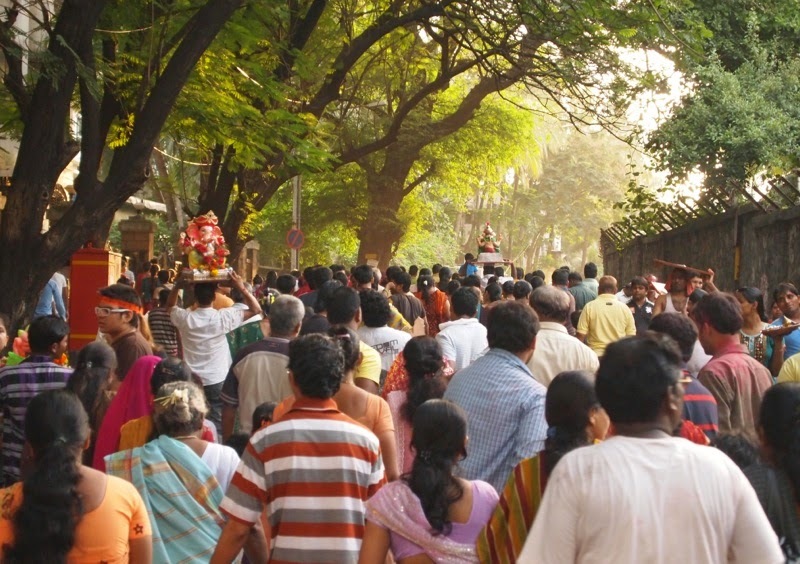 A coulourful Hindu festival in honour of everybody’s favourite Hindu god, Lord Ganesh. Ganesh Chaturthi is India at its best: technicolor religious fun, music, dancing, and everybody is welcome to join in. Oh, and this being India, you’ll be joined by a few million other people, all in a happy and joyous mood. 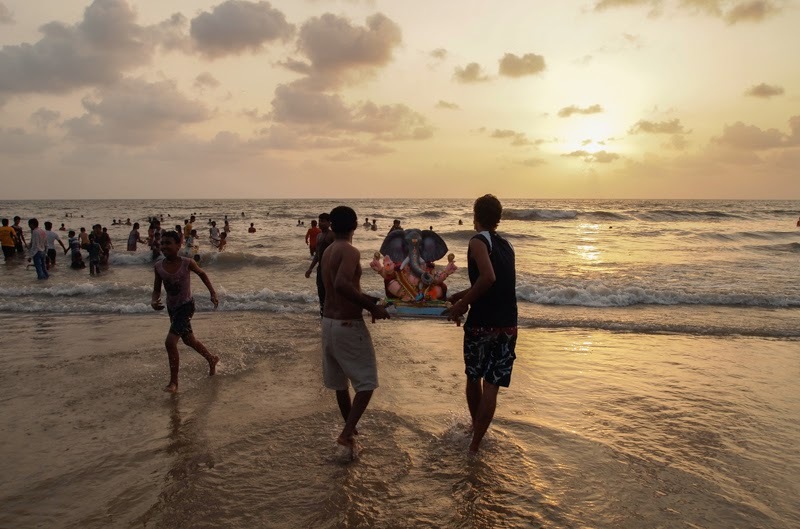 Bombay (Mumbai), mostly on its beaches, but also in purpose-built shrines around town, with colourful processions to get the sometimes massive idols from shrine to shore. 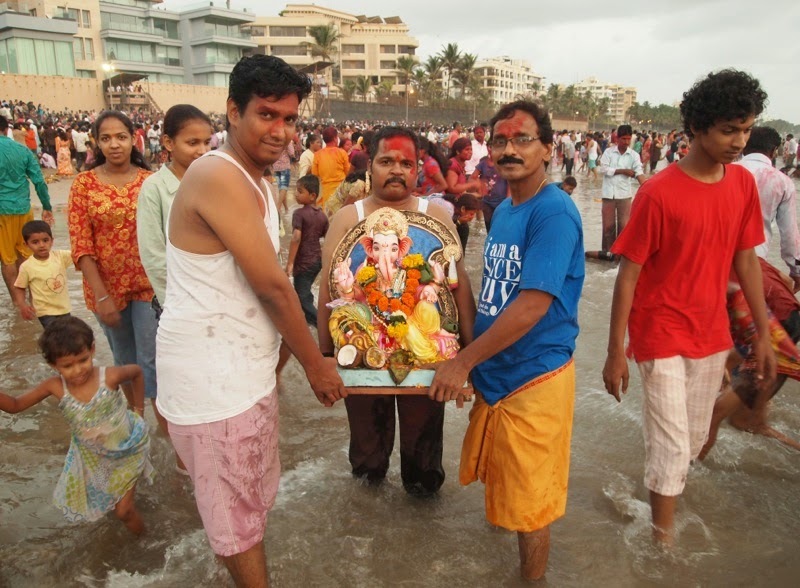 Girgaon Chowpatty (Chowpatty beach) sees the biggest idols as well as bone-crushing crowds. For a slightly (but only slightly) less crowded experience, head to Juhu beach, which is great fun too- try either the main area or a little further north near ISKCON temple, where the pictures here were taken. Map. 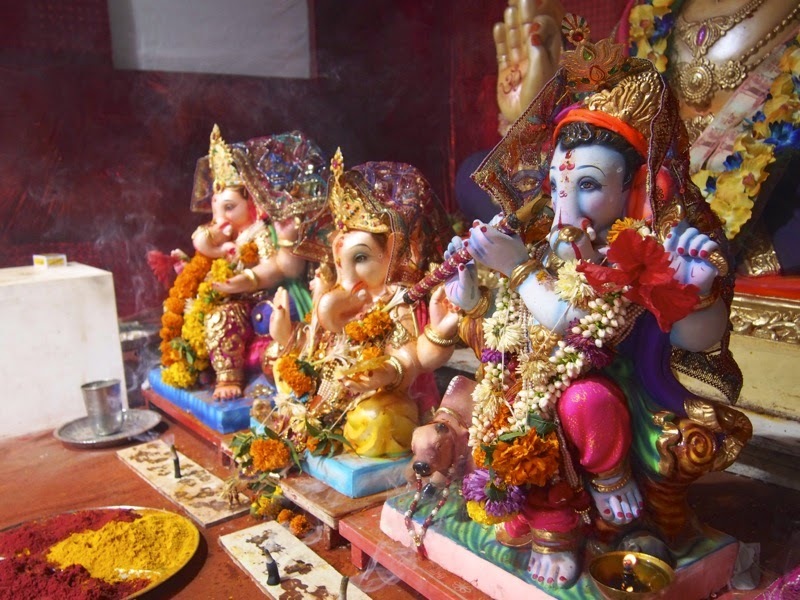 GANESH CHATURTHI (ALSO known as Ganpati) is a festival that is little known outside India. 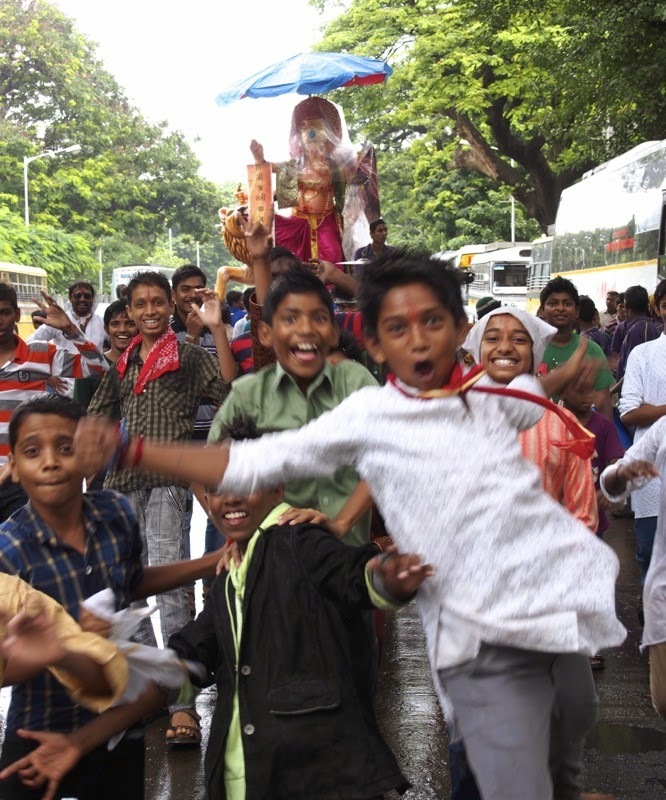 You may have heard of Divali, the festival of lights, and Holi, but Ganesh Chaturthi is at least as much fun. One of the reasons it’s relatively little known is that it’s very much a regional festival, celebrated in some parts of India. but not everywhere. It’s celebrated with a vengeance in the state of Maharashtra, of which Bombay is the capital. Bombay’s already notorious traffic comes to a screeching halt as millions of devotees parade through town with their Ganesh idols. Until the late 19th century Ganesh Chaturthi was mostly a private affair- but a concerted effort was made by Indian nationalists to create a 'people's fest' that would bring everybody together and build support across all castes and groups against the Britishers. To create universal appeal, there was lots of emphasis on outdoor pomp and circumstance. Ganesh Chaturthi is all about giving Ganesh a bath. Not just any bath- he is ceremoniously dumped into the Indian Ocean that lines Bombay. 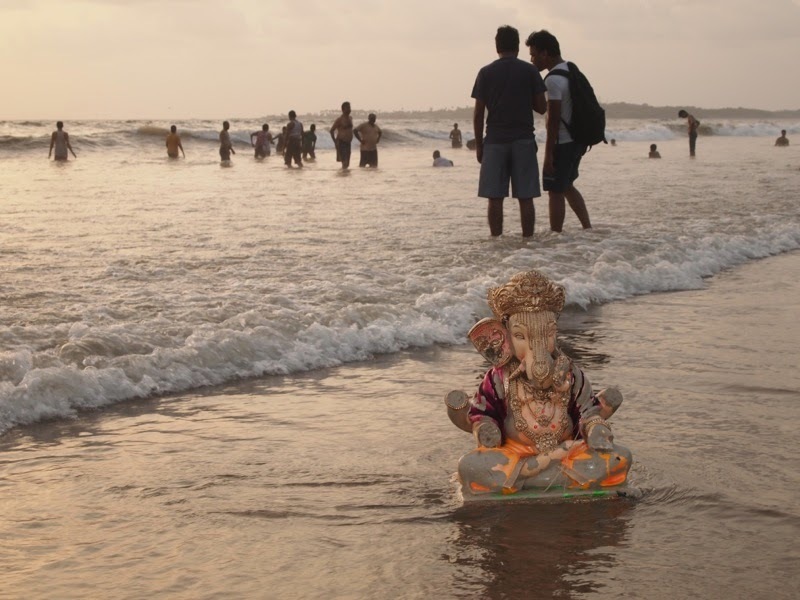 The immediate benefits of this are not clear- but the immediate downsides are: Bombay’s beaches are littered with plaster Ganeshas and environmental groups have started raising concerns. For now, few people give heed as they don't want to miss out on their opportunity to curry some favour with the elephant-headed god. 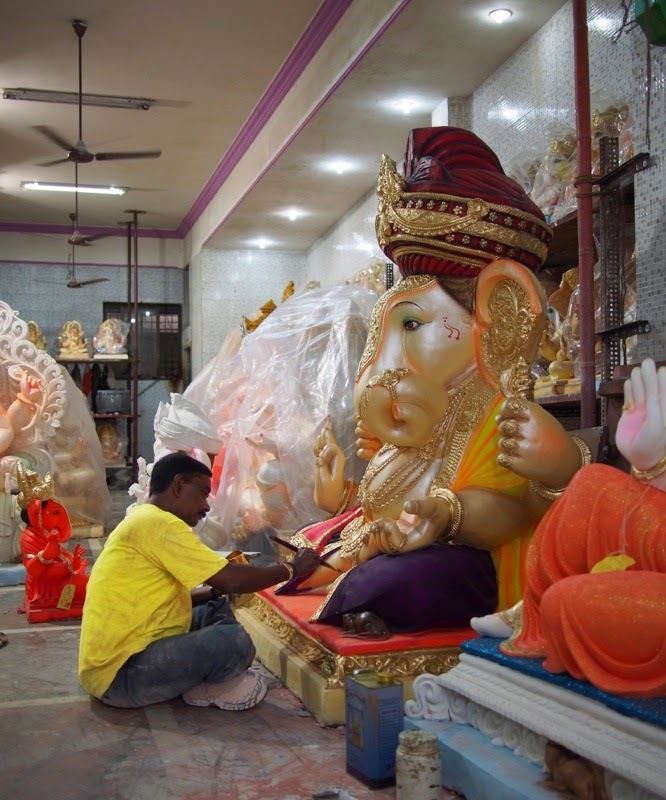 The preparation starts weeks in advance- families, groups of friends, neighbours, clubs etc order their Ganesh, which is usually made of plaster and made to order. 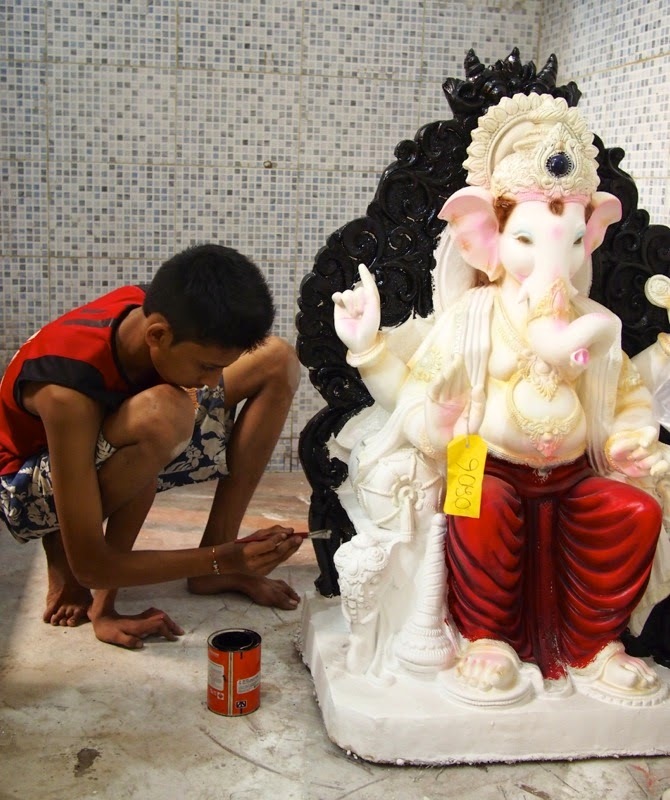 You can see them being made in workshops all over Bombay in the weeks leading up to Ganpati. Groups compete for the most beautiful as well as the biggest idol. The idols are displayed in temporary shrines called pandals which can be found on every street corner in the week leading up to the Big Day. Visiting them is part of the festive season, much like people go gawk at Christmas lights or nativity scenes in Christian lands. Three idols in a pandal. The right one appears to be dressed up as Lord Krishna. Confusing? Of course, somebody as important as Ganesh doesn't just move around by stealth. Both his trip from the workshop to the pandal as well as from the pandal to the place of ceremonial immersion turn into major events. This being India, that means the more noise, the better! Small groups may just sing and chant- larger groups or the conspicuously wealthy hire drum bands, trucks, loudspeakers, and dancers for a majestic parade to the beach. Once at the beach, preparations get under way for the immersion. Before Ganesh takes his bath, there are more prayers, singing, and people whisper wishes in his ear. Then- off he goes! on the shoulders off a few strong men (up to 20 for the larger idols!) and then it’s sink or swim for Ganesh. You never walk alone- the access road to Juhu beach. Final blessings before the final dip. 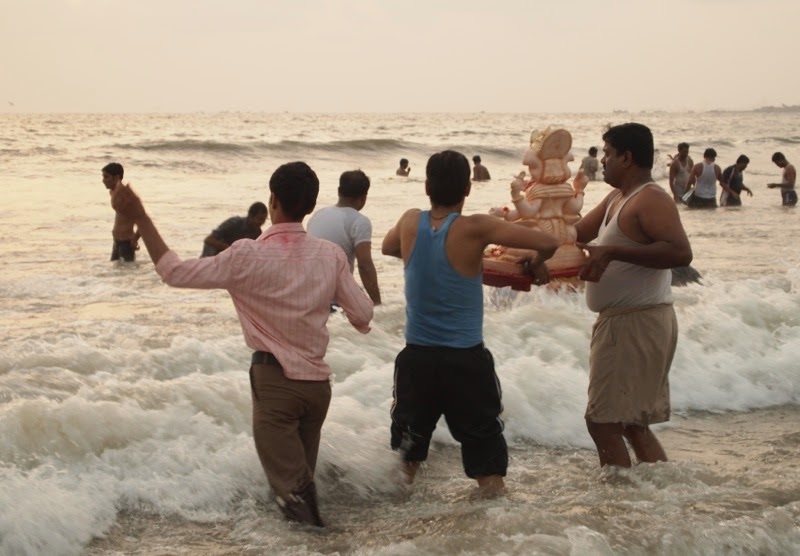 This is the most dangerous part of the whole event- not just for the Ganesh idols who invariably end up damaged and washed-up on the shore. Many Indians can't swim and every year a few over-enthusiastic devotees end up drowning in the toxic waters of the Indian Ocean. 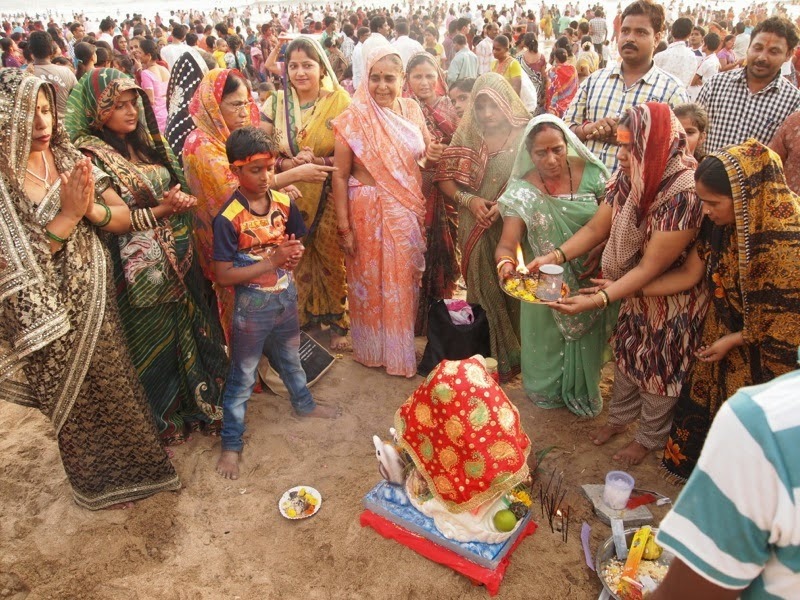 Other than that people are friendly and welcoming- bring your own Ganesh idol (easily purchased) and join in the fun! As said, this is an annual festival, so if you can, make sure you're in Bombay on the right days. 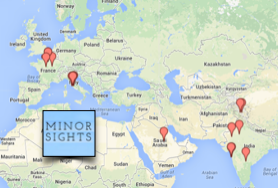 The festival lasts ten days with immersions and parades taking place throughout the period. Most likely Ganesh will get to you before you can get to him. 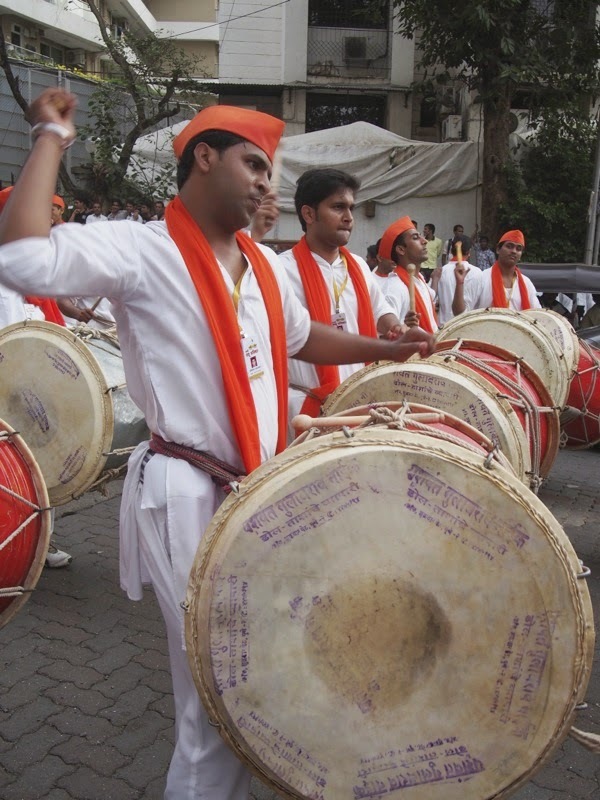 Activities take place all over Bombay, and may stop you in your tracks as slow-moving processions block all traffic. Be prepared for crowds and lots of walking to reach the actual beach. About.com's India page has the dates for the next few years.